The Free-spirited, fun loving and Fabulous Ms. Karima Trotter, a loving Mother, Gospel Recording Artist, and a Business Owner. She is apart of the Dove Awarding-winning, Steller and Grammy-nominated gospel music group Virtue. I had been a Fan of hers and Virtue since their first Self-titled album back in 1997. Even though I loved just about every song the ones that stood out to me the most was “Angels Watching Over Me”! It had me in tears of joy, and it comforted me and brought me closer to God! And who can forget “Put your War Clothes On.” girl, I had it on repeat!! I absolutely loved their Album “Virtousity” that was released back in 2001, had the whole entire album on repeat! And I thought the girls were so gorgeous on the cover looking like angels! On February 26, 2016, she and her beautiful sisters Ebony and Heather released an Album called Fearless. This album they kept their roots and originality but added a new generation twist to it. I love “Walk It Out, and You Are.” they are my favorites on this album. If you haven’t already, please get it, you won’t be disappointed! Ms. Karima has many talents, not only can she sing she can cook! She started a Homemade Soup Company named “That Soup Chic,” I remember when she shared her very touching and inspiring testimony about it on Facebook, she makes her soup with local fresh veggies and uses organic poultry and with some added love! If you follow her on Instagram as I do, you will also enjoy her post; they are full of life and inspiration with a kick! She recently started a Faith-based women’s blog on Instagram called “Make It Rain Sunshine” where she uplifts and encourages women about life, dating, fashion, health and beauty, and faith! If you are looking for Down to Earth Fun with a side of realness, follow her Blog! Ms. Karima, I would like to thank you for your kindness and generosity, thanks for your encouragement and always sharing a smile! Thank for rocking our T-shirt from our new Collection!! We see the Blessings on You! You are a Blessing to me and others! To order the shirt she is wearing visit our shop! To watch the Facebook Live video click link below. Click On The Link below and you will be able to customize in any style or color. You can also click on “Shop Quote Me Customized” in our menu. New Collection is coming in March 2018. 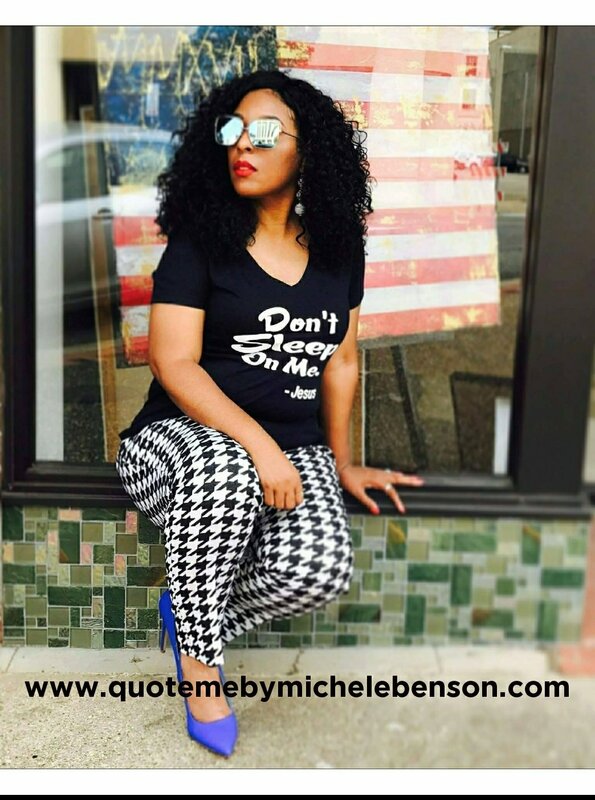 Featuredby "Quote Me" by Michele L BensonLeave a Comment on New Collection is coming in March 2018. What makes God happy makes me happy. And for your child to get mad and upset and don’t show any appreciation for the gifts we have bought them it would be a shame before God for them to show that type of behavior. I believe that we would be pretty angry at the fact they didn’t appreciate the hard work or the sacrifice we’ve made for them in getting those gifts. In saying that, let me share with you the reason why we should be a GRATEFUL CHILD; God paid a massive debt by giving his Son to die for our sins. Jesus Was born to die for all mankind. It is sad to say that half the time we are not grateful for Gods gift his Son. What I mean by not being thankful is that we don’t accept Jesus Christ into our hearts as our Lord and Savior, He is our gift of life. We say that we claim Jesus but never tell others of his goodness less known the good news of the gospel. Jesus is a gift to be shared. Imagine how God and Jesus both feel about us not appreciating the fact that he gave his life for us to be free. Jesus came to earth and dedicated his whole life for the purpose of redeeming us back to the Father. I am grateful that Jesus was born. I am grateful that Jesus took my place on Calvary’s Cross. Let’s not let it be all about receiving presents but about accepting the presence of Gods Son. Without Christ coming into this world and dying on the Cross, it wouldn’t be no Christmas. As his creation, we have to do better by showing our gratitude for all that he has done for us. Don’t take for granted that God gave his Son and his Son gave his life, and they both gave us the gift of power the Holy Spirit. This is the time we celebrate our present from God, his Son baby Jesus. When you open up your gifts on Christmas morning, say a quick prayer showing gratitude towards the real reason for the season. Show the world how grateful you are for Gods gift to the world. Prayer: Lord, thank you for sending your Son to die for my sins. Jesus, thank you for dying for my sins. Thank Heavenly Father for all that you have done for my family and me throughout this year. Lord, I am your Child, and I am grateful! Amen and Thank God. 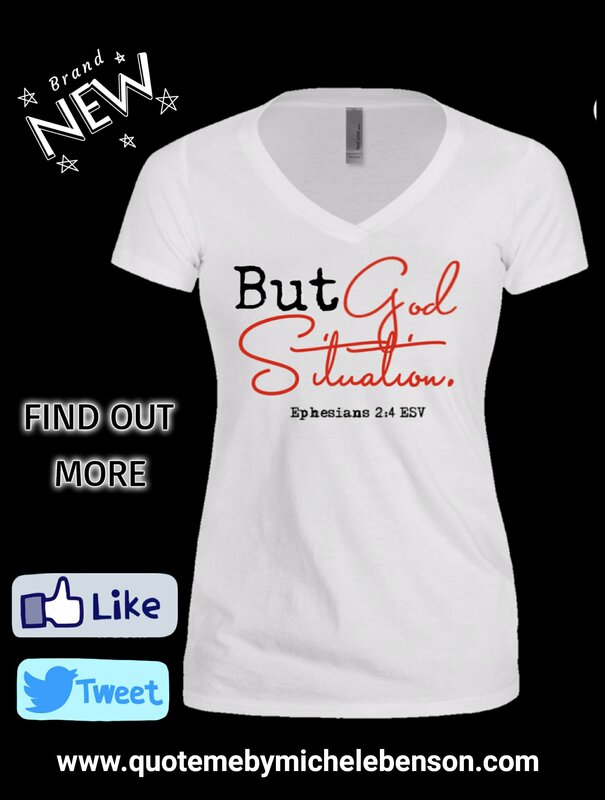 “But God situation” Ephesians 2:4 ESV New Item soon! 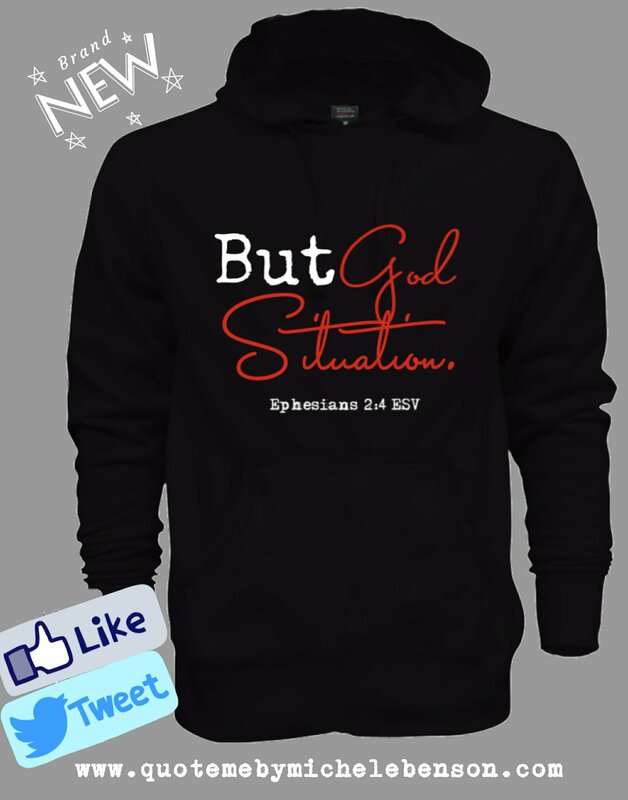 Featuredby "Quote Me" by Michele L Benson2 Comments on “But God situation” Ephesians 2:4 ESV New Item soon! 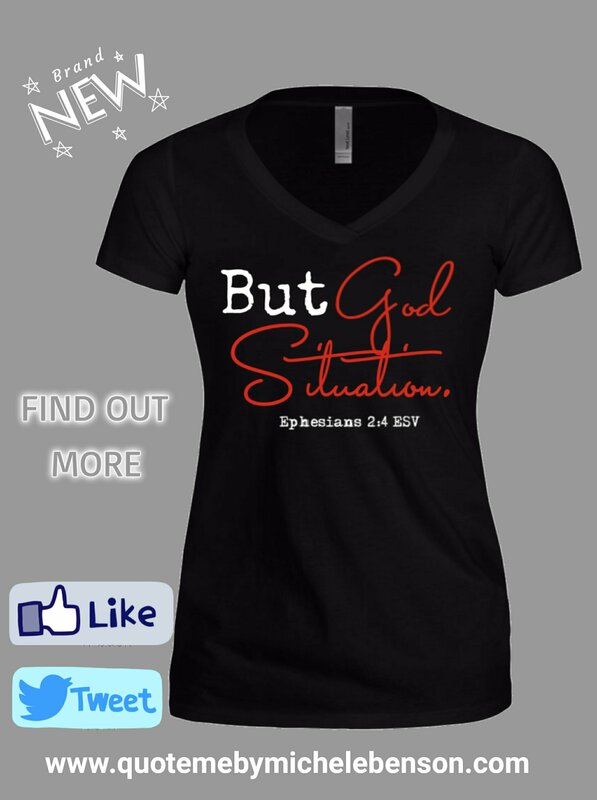 “But God situation” T-shirt design was given to me by the Holy Spirit and right away I remembered the scripture from the Bible. We all are in a “But God situation”, if it had not been for the Love of God and his mercy towards us where would we be? Every day we see His grace working in our lives. God has saved us from the seen and unseen situations that could have caused us harm. We often hear others testify and say ” But God!….” every time when a situation could of end up being a Tragedy but He turned it around! Glory to God!! Also, Remember this Loves to give all of your problems, pains and imperfections to God, he’s the only one who can handle it! It’s God’s situation, not yours. Message for #America “(“Behold, I am coming like a thief! Blessed is the one who stays awake, keeping his garments on, that he may not go about naked and be seen exposed!”) Revelation 16:15 ESV . May I introduce to you..
May 8, 2018 May 8, 2018 by "Quote Me" by Michele L BensonLeave a Comment on May I introduce to you..
Quote Me Past Items On Sale! March 22, 2018 by "Quote Me" by Michele L BensonLeave a Comment on Quote Me Past Items On Sale! I have a few of these items left, they are still for sale! If you are interested in them please let me know! We had so much fun doing this shoot! I want to thank my beautiful daughter Kori for her style and for doing our makeup! Photo shoot credit by Mr. Jayland. For if you live by its dictates, you will die. But if through the power of the Spirit you put to death the deeds of your sinful nature, you will live. And you yourself must be an example to them by doing good works of every kind. Let everything you do reflect the integrity and seriousness of your teaching.